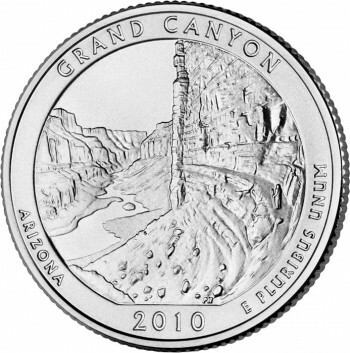 The United States Mint has published production figures for the Grand Canyon National Park Quarter which launched into circulation on September 20, 2010. The numbers show more were struck in total than the prior three quarters. According to figures, 70,200,000 Grand Canyon quarters were produced. When broken out, 35,400,000 were made at the Denver mint, and 34,800,000 were manufactured at the plant in Philadelphia. Question: Can I order previously released coins once the United States Mint has stopped shipping that specific design to the Federal Reserve Bank? Answer: Orders for previously released coins will be accepted as long as unassigned inventory exists. The United States Mint may produce additional coins to satisfy orders throughout the year for the first few designs if time and resources permit; however, there is no guarantee, and orders may be refused. As the end of the calendar year approaches, flexibility in supplying previously released quarters diminishes. Additionally, Federal Reserve Bank orders will take precedence over the bulk purchase orders, which may affect the United States Mint’s ability to fill new orders for previously released coins. In one sense, it is somewhat encouraging that the most recently issued quarter has higher quantities, because that is a small sign of an improving economy. The Federal Reserve might be ordering more coins because consumers may be spending more than they were earlier in the year. Whatever the reason, the quarter mintages have improving since the launch of the Hot Springs quarter on April 19, 2010. Collectors, on the other hand, might prefer lower numbers, because scarcity in many cases helps drive values. Higher Grand Canyon National Park quarter mintages can make it a bit less difficult to find them in circulation. The Grand Canyon, being one of the Seven Natural Wonders and a World Heritage Site, draws 4.5-5 million visitors per year. The new quarter makes a handy souvenir even for those who do not normally collect coins. Still, the production numbers are not terribly high when compared to quarter figures prior to the American recession. And the coins are extremely difficult to find in some areas of the country — especially from both Denver and Philadelphia. There is another option to get them, although there is an extra cost. The U.S. Mint started selling Two-Roll Sets and 100-coin bags of the Grand Canyon quarters on Monday, September 20, the day before its official launch ceremony. The sets contain one roll of 40 circulation quality quarters from Denver and another roll of 40 quarters from Philadelphia. Their cost is $32.95 a set. The 100-coin bags contain circulation quality strikes from either Mint facility for $35.95. Orders are accepted by phone at 1-800-USA-MINT (872-6468) or by visiting the Mint’s online store at http://www.usmint.gov/. The standard $4.95 fee for shipping and handling applies to all domestic orders. The fifth offering in the America the Beautiful Quarters™ Program will be the Mount Hood National Forest Quarter. It will be released into circulation on November 15, 2010. I am curious to know what if anything the National Parks Service receives in funds from the proceeds of the mint sales of these ATB quarters . Thomas, the NPS receives no funds from the quarters. They are authorized to resell the 5-ounce silver bullion coins that feature the same designs of the quarters, and could potentially make money on those. However, the NPS has chosen not to resell them as of this time. The Grand Canyon NP is also a World Heritage Site, one of 21 such sites in the United States, it ranks with other sites such the Pyramids, Stonehenge and the Great Wall of China.